177 Series Wing Spar Cap Cracks | Tennessee Aircraft Services, Inc. The Cessna 210 series underwent a major redesign with the 1967 model. The hallmark wing struts went away, and the plane was fitted with full cantilever (no struts) wings. The following year the 177 Cardinal was introduced with many non­typical Cessna features, including lighter duty versions of the 210 cantilever wings. It, then, came as no surprise that Cessna would publish a bulletin relating to wing spar cracks found in the Cardinals very similar to those found on the 210. 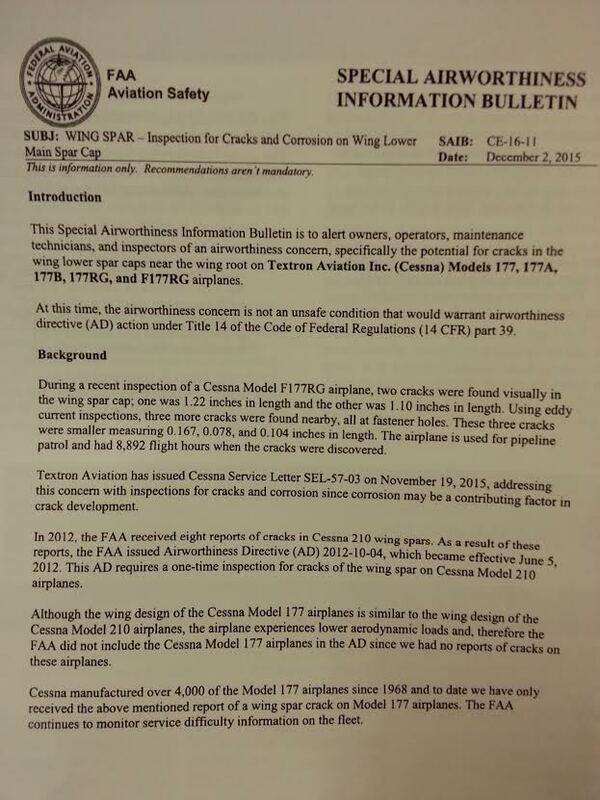 Cessna published SEL­57­03 on November 19, 2015 to address the 177 spar cap cracking issue. The surprise in the bulletin was found in the first sentence stating reports had been received of cracks found in spar caps. 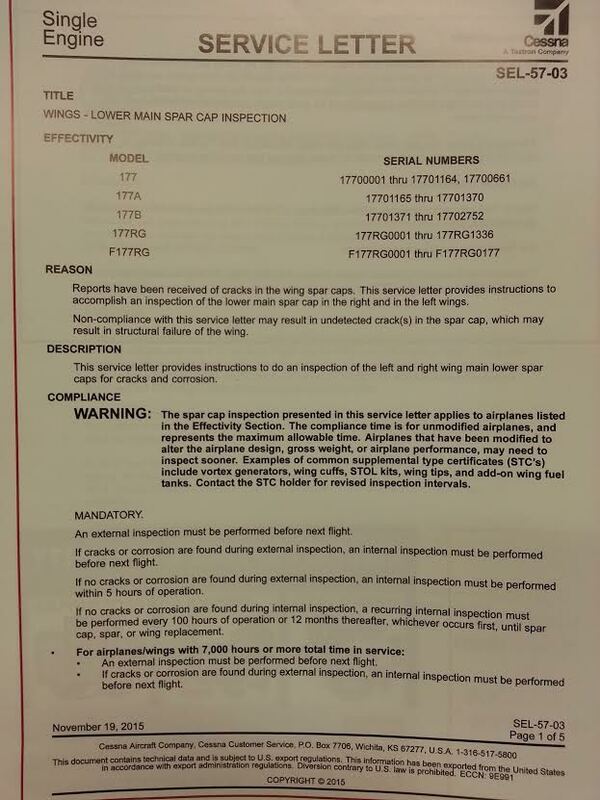 A quick search of the FAA list of defect reports doesn’t show any reports of Cardinal wing problems, of any kind. A few emails to other Cardinal experts and those in the know didn’t turn up any previous knowledge of known spar cap cracks in a 177 series plane. 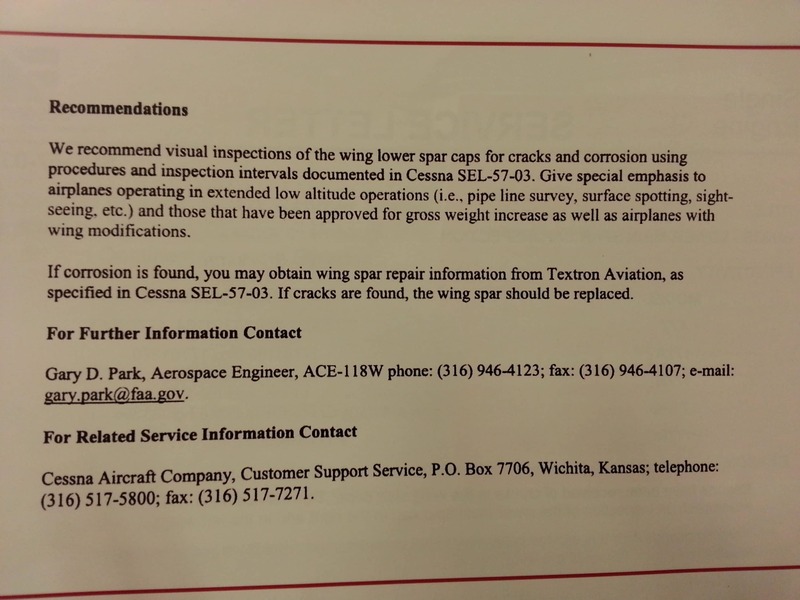 The FAA then published SAIB CE­16­11 on December 2, 2015 concerning spar cap cracks in the 177. 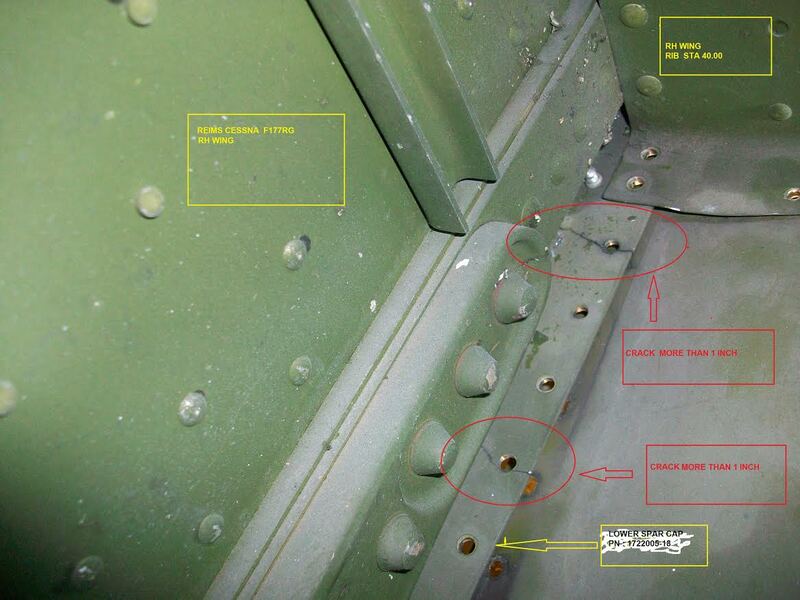 The SAIB also included some details about the plane and the cracks that were found. There were two very long cracks found visually and three smaller cracks found using eddy current methods. The plane had a total flight time of nearly 8900 hours. I also received an email from the FAA with more details, including a picture of the damaged spar. It is a French aircraft and operated since 2008 in pipeline patrol. It accumulated 4600 hours of the 8900 in this operation, which adds up to about 660 hours per year bouncing around at low altitudes. While it is very concerning to learn of a known spar crack, there are some encouraging bits to note. This wing had what anyone would consider to be extreme spar damage, and yet it was still flying. Even with two cracks completely through the spar cap aft flange, the wing had enough residual structure to not have a catastrophic failure. If the information about crack growth learned from research on the 210 spar cap is applicable to the 177, then frequent visual inspections should locate any safety concerns well before ultimate failure is reached. The key is to be sure someone looks. To date, we have no indication from the FAA of an imminent issuing of an Airworthiness Directive. That doesn’t mean we shouldn’t go take a look just in case. We’d recommend the area be thoroughly cleaned and visually inspected at least at every annual. In truth, this should be a simple five minute part of every inspection. The only special tools involved are a flashlight and a mirror. It’s a very small investment that could yield big returns.